Today, I have an important message to share with you. 1. This is My Name FOREVER. 2. 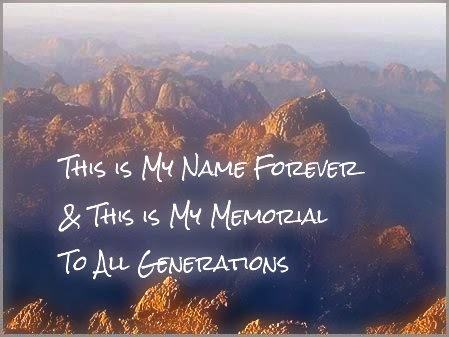 This is My MEMORIAL to all generations. 2. Yahweh is the name that the children of Isarel shall call Him from generation to generation. Come, let's call on God's Name in prayer together. We have the responsibility to declare God’s Name today. We also need to declare God’s Name to our children. And in turn, our children will declare God’s Name to the next generation. God’s Name is to be remembered down through the ages.